Q: I am lucky to have a lot of interns for my arts and crafts business, and since my shop’s been doing well, I want to compensate them properly. Since they are not my regular employees, how do I pay them? Are there any minimum-wage guidelines I should follow? A: Hiring interns is a common business practice. It is cost-effective because you don’t have to pay them a full salary like your regular employees. You only need to pay them for the actual number of hours worked in your company at the rate that you agree to pay them. 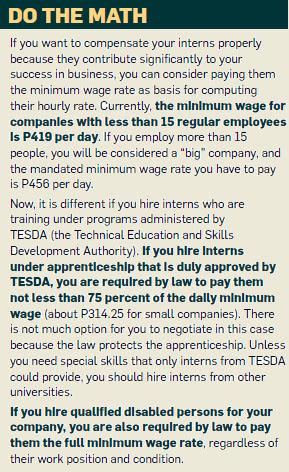 This rate is negotiable, and you can actually pay any rate that is acceptable to you and the intern. In fact, you may negotiate not to pay at all if the intern is desperately looking for work in order to fulfill a certain number of hours to comply with academic requirements, and you happen to be in a low season when you do not need extra staff to help in your business. As a company policy, it is advisable to fix an hourly rate for all interns, whether you need them or not, ensuring that interns are well compensated for their contribution to your business. The minimum that you can cover probably will be the cost of their transportation to your office and lunch meal. If you are feeling generous, you can also pay bonuses as incentives for them to work harder and be more productive. The bonus can be, for example, a certain amount per piece in excess of your budgeted production, or a percentage of sales in excess of the monthly quota. The bonus can be awarded individually or as a group for team effort, which they can then share equally. At this level of your business, are you required to pay minimum wage to your regular employees? If your company has been losing for the past years and the accumulated losses have resulted in negative capital, you may not be required to follow the minimum wage law. As your business has been doing well lately, you may not qualify for exemption anymore next year. If you are still a startup and your total assets are not more than P3 million, you may be exempted from the minimum wage law. Take note that the computation for total assets for this purpose does not include land property where your shop may be located, so this is actually favorable to you because it helps you lower the amount of your total assets. If you buy your inventory of crafts and arts from someone else and sell them at your shop, then you are categorized as a retail business. You may be exempted from the minimum wage law if you regularly employ not more than 10 regular employees for at least the past 6 months. If you think you qualify for one of these exemptions, you will need to apply with the Department of Labor and Employment for approval. A series of activities are involved in the application process, such as documentation, inspection by authorities, and hearings if necessary. It may take as long as three months before the process could be completed and approved. This story was originally published in the January 2013 issue of Entrepreneur magazine.